A Hall County, Georgia family had their stolen home videos returned by some remorseful burglars. Freeman said he was beginning to lose hope that he would never see the home videos of his two young children again. Freeman said he has documented the moment Jess and Julius were born until the present. He wanted his sons, now 4 and 5 years old, to be able to watch themselves grow up and cherish the moments they had with their grandmother who recently passed away. “They say if a picture is worth a thousand words, then a video must be like a million,” Freeman said. The Wall Street Journal has an article about the World War II home movies of Edwin Fitchett of Poughkeepsie, New York. 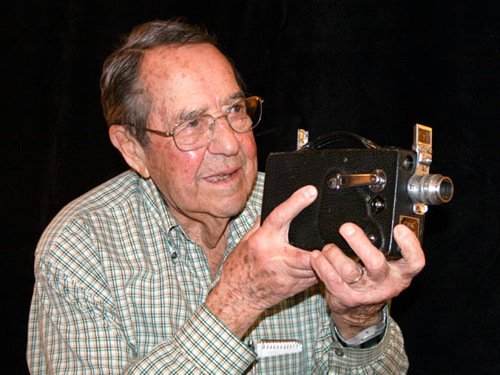 Fitchett got his first movie camera at 15 and recorded family trips and holiday gatherings. He continued his hobby when he entered Cornell University in 1940, filming college and fraternity life on the Ivy League campus in Ithaca, N.Y. He enlisted in the Army in September 1942 but remained stateside until July 1945, when his artillery battalion was shipped to the Pacific. His unit was training for the pending invasion of Japan when the war ended just weeks after they arrived in the Philippines. With U.S. military censorship restrictions lifted, Fitchett had his camera sent from home, along with any rolls of Kodak color film his parents could find. Soon he was taking the camera along on sightseeing trips to Manila and the Philippines countryside, often in the battalion’s flimsy two-seater planes used as aerial spotters.